Matt Pierre can remember a time when the only skaters in St. Ignatius were outlaws. Back then the town’s only good skating surfaces ran outside local businesses. Skaters, frequently harassed by law enforcement, were eventually kicked off those properties. “At one point in time you couldn’t even set a skateboard on the sidewalk without getting ticketed,” Pierre said. But the community’s lack of recreational outlets for kids took on a special urgency after tragedy struck in the fall of 2003 and the winter of 2004. It was during that time that four boys died in alcohol-related incidents in the Mission Valley. 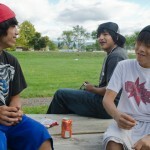 The following spring, the Flathead Reservation community gathered to confront the problems of substance abuse and the lack of youth activities. Less than a year later, St. Ignatius resident Kristie Nerby, whose son skates, started the Recreation Coalition to look for answers. The group’s members chose a volunteer-run, nonprofit 10,500-square-foot skate park as their inaugural project. Donations to Skate Ignatius came from everywhere: from the Tony Hawk Foundation, from Pearl Jam bassist Jeff Ament, and from the Montana Skatepark Association. Hundreds of personal and business donations flowed in from across Montana and the nation. Today, skaters like Matt Pierre can walk to Skate Ignatius, the product of five years of work and nearly $300,000 in contributions. Once there, he can roll though a park that he helped to design. He helped raise money for it too. “This park is pretty much our dream,” Pierre said. 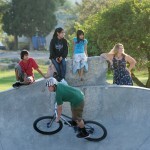 On any sunny afternoon, skaters and bikers crowd the park, waiting for their turn to roll. They take turns shredding its two deep bowls. Kids who didn’t skateboard a few years ago are now winning competitions and flying through the air alongside their friends. St. Ignatius’ concrete park is highly sought-after. Carloads of skaters from Missoula make the trip regularly. 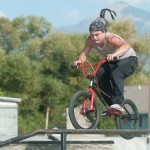 Some skaters have come from as far as New Zealand. Kids just learning to skate often ride alongside those who have been skating together for years at Skate Ignatius. While not everyone understands the skate culture, Nerby embraces its passion.